Near downtown Chattanooga that is in American State Tennessee there is a marvelous Sinks disc golf course. You can spend just ten minutes driving to this wooded eighteen holes course. Its unusual name is derived from its particular construction – many large and deep sinkholes scatter throughout the course. You can come here and enjoy the game. In general this kind of sport was regarded as a result of some games combined and the main one of them is Frisbees. The simple principle that should be followed during the game is that a player should aims at objects made up of trash cans, pipes – anything that is handy. Seems simple? We wouldn’t say so! The creator of Disc Golf is Ed Headrick who invented and patented this game named “Frisbee Pole Hole”. But this version was declined because the Frisbee was a patented trademark owned by other person. So, Headrick decided to choose a different name – “Disc Pole Hole”. In 1976 he established Disc Golf Association (DGA) creating a new sport at the international level, the details of which you can find out on its website. And the disc golf courses started to be constructed in the world. At the very beginning disc golf was played by players who are specialized in Frisbee and know how to throw Frisbees at holes. The rules were developed but still this game was included in different sport events as side activities. The players tried focusing on trick throws more than at formal game. And only when Headrick managed to construct the first permanent course, this sport became recognized. That was a kind of revolution in sport! In 1974, Headrick officially offered to create a permanent Disc Golf Course that was approved and the course was designed and constructed in 1976 and here the chains were used to stop a disc instead of poles made into the ground with use of cement. Mr.Headrick not only founded the above Association, but he started the Junior Frisbee Championships, established the World Frisbee Championship and after that he continued to develop and standardize the Disc Golf as the sports. Today this unique game is extremely popular being one of the most intensively developed sports. There are already about 4000 courses, which are registered with the PDGA in the whole world. For amateur sport one can buy all necessary tools at store and create a kind of Disc Golf somewhere in the open air. In general disc golf looks very like as regular golf. But here the golf balls, which are intended to target the holes, are replaced with golf discs, which aim for a Disc Pole Hole. The pole extends up from the ground with chains and a basket where the disc lands. The player is expected to fill in each hole with a disk during the determined number of throws. Usually, a course is equipped with up to 18 Disc Pole Holes. And that player wins, who has the lowest total cumulative score. There are other important differences from regular Golf. For example Disc golf courses can be developed on simple land without any special preparations and even not suitable for other sports activities. In general this game is very amazing and can be played by anyone. All that is needed to do is to be able to throw a disc. The sport is considered as outdoor activity and requires concentration and first of all self-possession and cool-headedness of a player. Disc golf is used in Schools and College campuses. It teaches to focus on strategy and to play in a team. This game is a perfect chance to exercise in order to run off excess fat and stay in a good shape. You can enjoy it and improve your health. 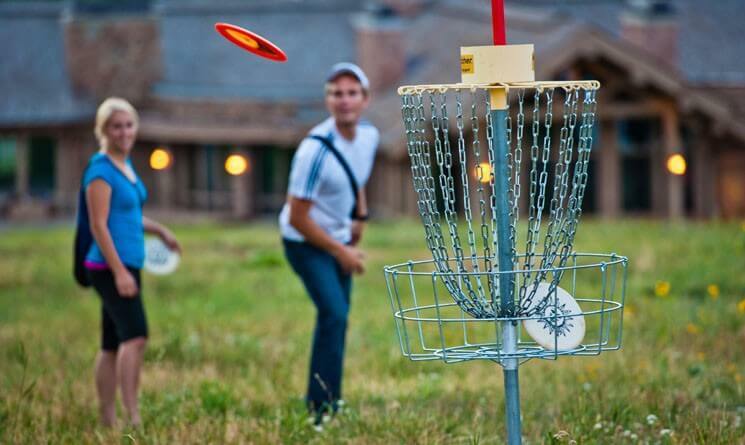 A modern disc golf course can be situated at any land about 4500 ft long for an 18-hole course. Walking along such a field one can reduce your risk of a range of health problems. So stop searching online slots and become a Disc golf player! The player should throw a disc only when he is completely sure that he cannot harm any other participator this is true both for its flying and landing. When one tries to aim a hole, he has a tee-off, after which there are several throws made one after another until players reach the basket. Scoring is easy: when a disc is thrown, a stroke is counted as well as when a penalty is charged. At the end of the game the strokes are totaled and the player who has the fewest strokes is a winner. Every throw is marked with a marker disk – a special disk not used normally during a game. In general there are several types of disks. Putters have the construction that makes them fly straight that is why a player uses it for shots, which must be strictly controlled. Mid-range discs with sharper edges as compared to putters can fly faster cutting through the air. They are good for a beginner. Drivers differ from the above types with their sharp edge and concentration of most of their mass on the outer rim instead of being spread equally throughout the disk. They can fly faster at a longer distance. The various kinds of plastic can be used for discs changing a little bit its performances.